Are you using your mouthwash wrong? One of those items is the mouthwash. 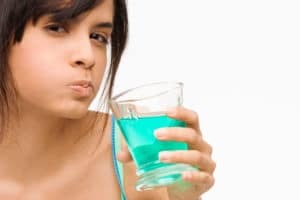 You will be surprised to know how many patients come to the clinic and state that they don’t use mouthwash at all. One of the reasons is that they are just too lazy or it is too expensive for them. Well, if money is a concern to buy mouthwash, maybe you should check out the prices in the pharmacies in Los Algodones. They have excellent offers in several products like toothbrush, dental floss and of course, mouthwash. Mouth wash is not a useless ally to have in your bathroom next to your toothbrush. It is not a thing that you use before dates or special occasions. Mouth wash is an item that you should use daily, you don’t want to spend a day without using it, just like brushing. That means that using mouthwash at least twice a day will improve your dental health by a lot. Keep in mind that it is best for you if you use your mouthwash after brushing and flossing your teeth. Just put a little cup in your mouth and rinse. Remember to spit it out after 30 seconds or so of rinsing. Drink it doesn’t do any harm but it can give you a stomachache. Many patients also ask me about what kind of mouth wash is the best. Personally I suggest that you get one with the ADA Seal of Approval. This seals means a lot for dentists because it means top quality. I also recommend antiseptic mouthwash, because that way you will be getting rid of all the bacteria that can ruin your smile. As I was saying above, mouthwash does not just give a minty fresh breath. It does a lot more than just that. Antiseptic mouthwash kills bacteria in the mouth, giving you protection against foul breath, dental caries and gingivitis. Some mouth wash comes with fluoride, which strengthen the teeth and makes them more resistant to diseases. Other patients have asked me about homemade mouth wash. I say no, don’t do it. In my experience, those are no effective at all and it doesn’t compete with a mouth wash made by a good company. Remember that those companies invest tons of money on research and development to have an edge in the market. You can’t compare a little water and salt to fluoride and other chemicals designed to clean your mouth and teeth. On the same note, recent reports pointed out that you should avoid mouth wash with alcohol. They tend to dry your mouth and in the long run it affects your teeth. Many companies are aware of this and if you read the ingredients on the sticker of a mouthwash you will see that alcohol is missing. Another thing you can notice is in the front sticker they usually have a space dedicated for saying that the product has no alcohol.